Published in The Lebanon Democrat Tuesday, December 16, 2014. Only the photo of the puppet theater was included with the column. The others were added for this post, although my editing skills with the Mac are still being tested and two photos are small. The one of Kinsley hardly captures what a beautiful, fun, and behaved young girl she really is: a true delight, and i am looking forward to spending more time with her and her wondeful mother, Renee, in the coming year. Cousin Nancy, i wish you were here. SAN DIEGO — Our weekend included packing for our Christmas trip, but Sunday, we had a Christmas treat of our own in the Southwest corner. 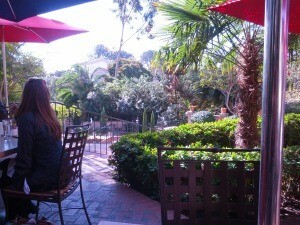 Late Sunday morning, we drove to Balboa Park. While most people associate Balboa Park with the San Diego Zoo, there are many other facets to the park, which was established in 1892 and blossomed in 1915 when the Panama-California Exposition was held in the city. The park has a working theater, a replica of Shakespeare’s Old Globe along with too many museums to count, hiking trails, gardens, and restaurants. We ran some Christmas errands before lunch at El Prado, a wonderful restaurant housed in one of the exposition buildings with a courtyard in front and outdoor dining in back, which overlooks a pool, fountain, and garden. We had lunch outside and could have spent several hours there, but we were on a Christmas mission. There was a Lebanon connection, or at least, a Cumberland connection. We were on our way to meet Kinsley, the great, great granddaughter of my Aunt Evelyn Orr, who was mentioned in an earlier column about Thanksgiving and the road to Chattanooga. Evelyn’s daughter, Nancy moved to Florida where she still resides in Cape Canaveral. Nancy’s daughter, Kathy, moved to Michigan. Her daughter, Renee Hoskins became a Marine, got out and had Kinsley. They live in Oceanside. Just before Kinsley turned two this summer, we connected at, where else, the San Diego Zoo. This lineage dissection proves there are many ways to land in the Southwest corner. Our mission was to meet Renee and Kinsley at the Marie Hitchcock Puppet Theater in Balboa Park. The puppeteers were putting on a Christmas program. We thought that would be something Kinsley would enjoy. We drove to Balboa Park early, stopping at the zoo to pick up a few Christmas presents for our trip east, and then to lunch. I had the rock shrimp chile relleno while thinking it was not likely a menu item anywhere else except the Southwest corner. We sauntered past the Mingei International Museum where Maureen found a couple of gifts for friends, and I took note of some articles she liked but wouldn’t purchase for herself. Finally we made it to the Palisades area of the park where Kinsley and Renee were waiting for us. The theater is a full-blown auditorium in the Spanish Mission style architecture which dominates the park structures. The staff/cast/puppeteers put on five shows a week, changing programs weekly. This is year round.kinsley-puppets – 2I wish every child under five could attend such a show. Kinsley was enthralled. She rocked and clapped with enthusiasm with every new Christmas song as mice, cats, jacks-in-the-box, and a snowman pranced around the puppet stage. I felt about five years old myself (Of course, Maureen often accuses me of acting like a five-year old). As I tried simultaneously to watch Kinsley and the puppets, my mind wandered to the upcoming Christmas. We will be going straight, or as straight as we can on plane connections and tree-top airlines to Chattanooga tomorrow. Since 1992, Signal Mountain and Lebanon have been Christmas for Sarah, our twenty-five year old daughter. We wish to capture at least part of that this year. The special part of that is our grand niece, Allie Duff, another two-year old, will be the focus of attention. Allie is my sister’s granddaughter. From there, we head to Austin for our first Christmas with our grandson Sam. We have wanted to be with him for this special time since he was born seven plus years ago, but we had to make choices. You should note there is no Lebanon on that itinerary. Lebanon has been part of my Christmas holidays for about 50 of my nearly 71 years. I will miss James Cason making me a martini, a dinner with Mike and Gloria Dixon, spending time with Eddie and Brenda Callis and sitting next to them at the Sunday church service. I will miss Bill and Kathy Denny who took special care of my parents, and Charlotte and Kristy Johnson whom my parents considered family. And of course, I will miss Henry and Brenda Harding. Obviously, the biggest missing will be my mother and father. However, our Christmas this year is focused on children. I am sure my parents think this is the way it should be.